The Shiri Nav Durga Kali Ashram Temple at St Marys South Orpupouche. A WOODEN house built by the deceased Thakoor Hasmatally in south Oropouche 60 years ago, slowly emerged over the past 16 years into a few concrete structures which today houses a mandir, an ashram, half-way house, conference room, kitchen and a family living quarters on two lots of land. For the past four years some of these structures have been the subject of query from the Town and Country Planning Division (TCPD). Hasmatally’s son, Larry, 31, a pundit, established the Shri Nav Durga Kali Ashram, but on January 15, 2016, he received a letter from the the TCPD requesting his survey plan and deed for the property. The letter was based on a correspondence sent to the TCPD from a resident of the area complaining about the establishment of the concrete structures adjoining the temple. Yesterday, pundit Hasmatally said that he had complied and explained that his temple was established piece meal for the community throughout the years when he used to demolish parts of the dwelling house and replace them with concrete. He accomplished his mission over the last 16 years. In March of 2016, he said, Crystal Narine from the TCPD, acting on the resident complaint, visited him. “She told me that nothing was wrong with the structure,” Hasmatally said. And since no fault was found in him building a concrete structure having regard to Narine’s verbal’s expression, Hasmatally admitted yesterday that he did not await a formal reply from the TCPD granting official permission to continue breaking and building. 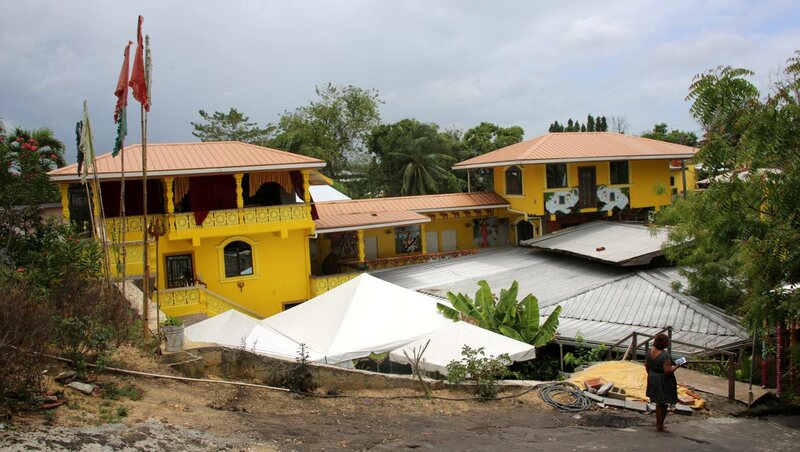 Worshippers have been using the temple, painted in safron yellow, to conduct services for the past 16 years and many people from the community have been utilising the facilities in the additional concrete structures which the pundit completed four years ago. A special puja was conducted in 2014 to commemorate its completion. That was when the resident had written the complaint. It appears that this additional structure is the bone of contention in Hasmatally being sent a letter last week Tuesday from the Ministry of Planning and Development signed by Minister Camille Robinson-Regis. Robinson-Regis’ letter orders Hasmatally to demolish the three additional structures on the property. Reply to "‘I got verbal permission’"